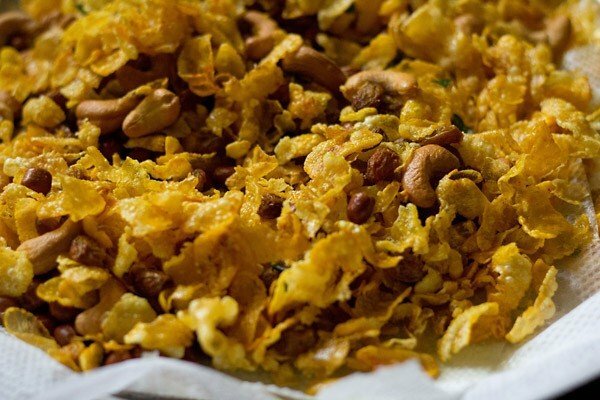 cornflakes chivda is a crisp, crunchy, sweet & savory fried mixture made with corn flakes, dry fruits and spices. 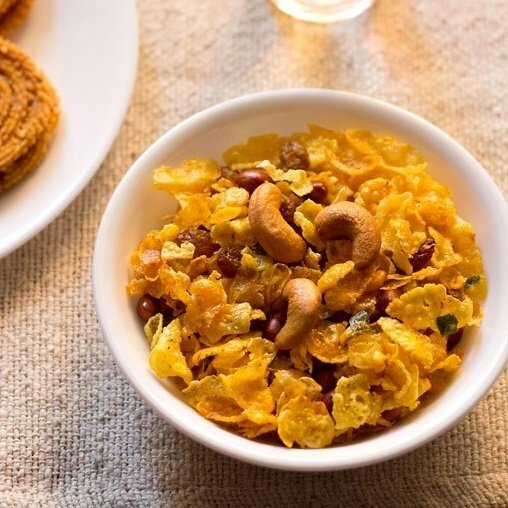 cornflakes chivda recipe – easy to prepare step by step recipe of cornflakes chivda. 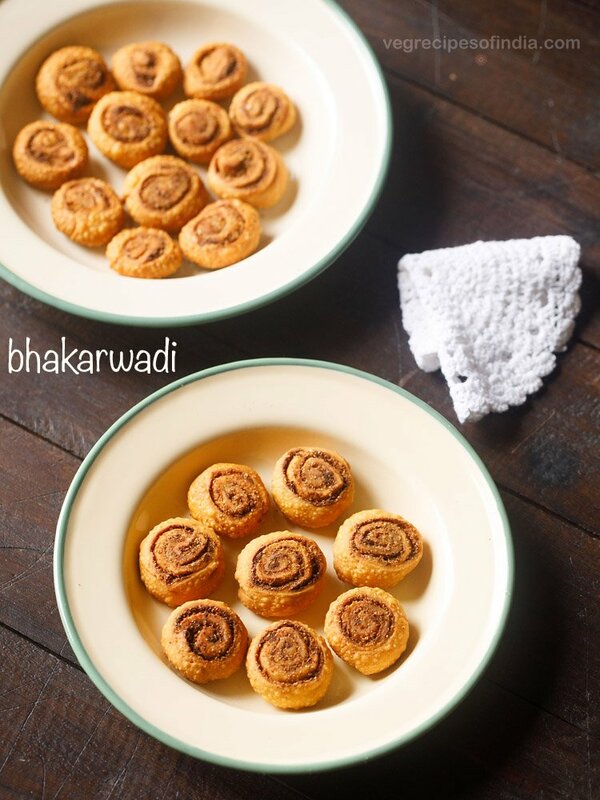 today i made these crisp makai chivda and also managed to take step by step pics. the recipe is easy to prepare. 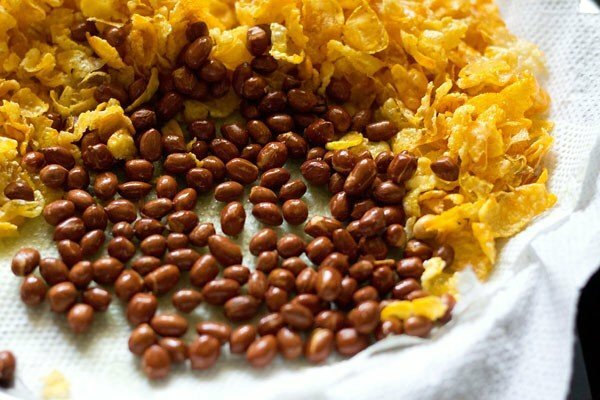 here i have used the variety of dried yellow colored cornflakes. these are deep fried to make the chivda. they are also known as corn poha or makai poha. you get them easily in the indian grocery shops. these are not the ready to eat cereal cornflakes. 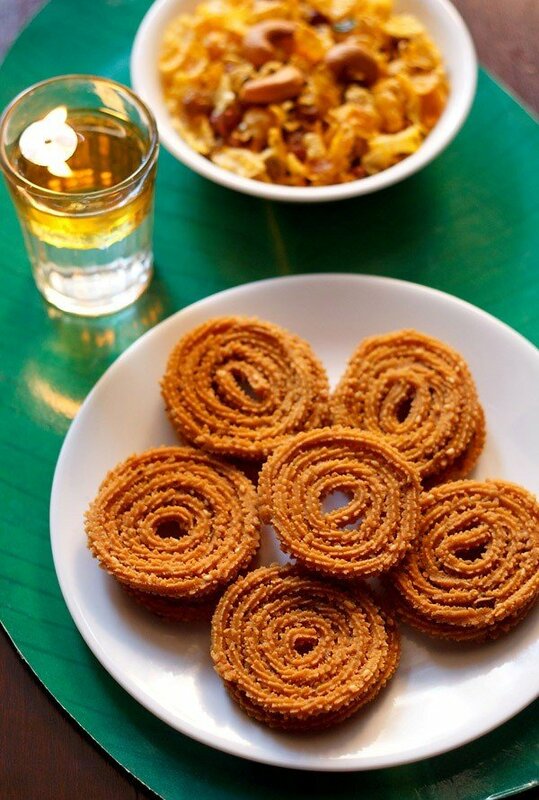 you can make this chivda, with the ready to eat cornflakes too. in this case you just need to lightly roast the cornflakes in a bit of oil. 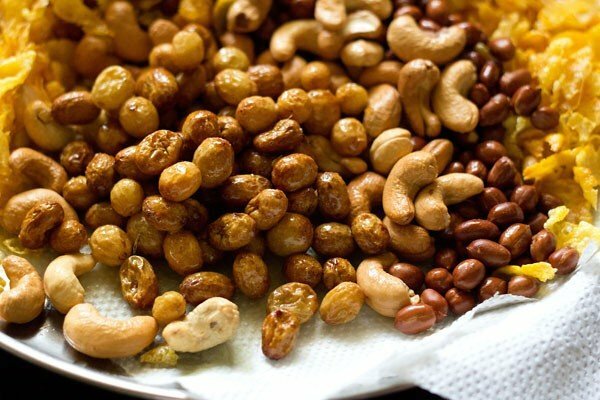 the dry fruits can also be roasted with some oil or without oil. this is a sweet and savory chivda. you can alter the spices as per your liking. 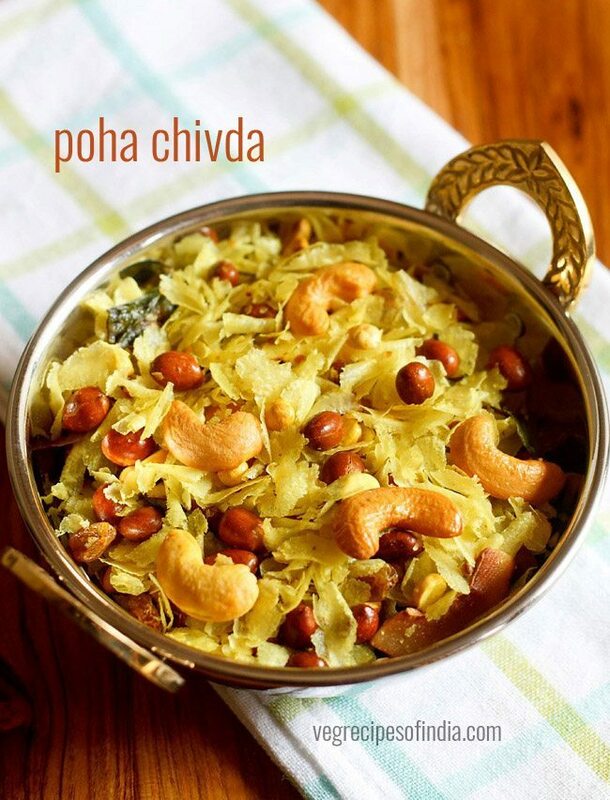 when making chiwda with poha or cornflakes or grated potatoes, always use a fine sieve ladle. in indian markets we get these sieve with a handle and they are very helpful for frying ingredients which have small pieces or flakes. just one equipment makes the frying process easy and a breeze. so you don’t waste time and energy trying to find out the corn flakes in the oil. also line one large tray or two to three plates or bowls with paper towels. the frying sieve ladle should be dry and so the ingredients. you will be frying everything one after the other, so the prep works helps and is efficient too. 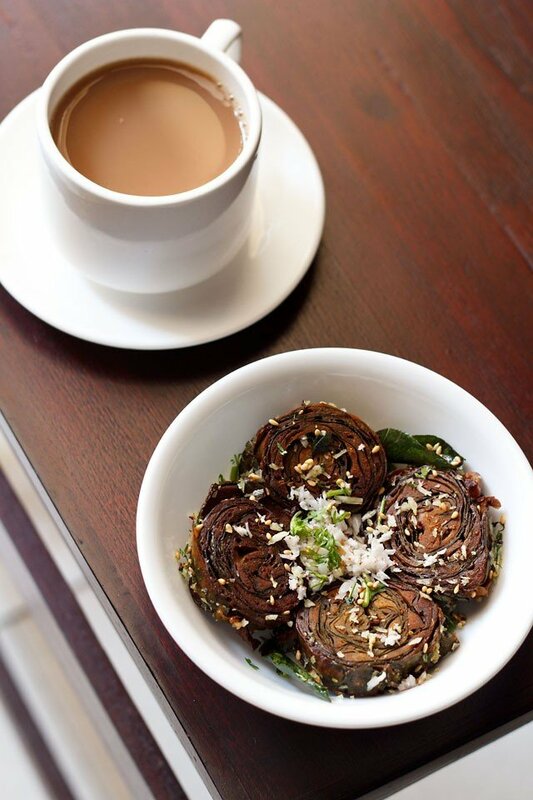 cornflakes chivda also can be served plain as a snack or with some chai. fine salt or powdered salt as required - you can add the regular kind of salt, but not sea salt crystals. first measure and take all the ingredients and keep them in individual bowls or plates. heat oil till its moderately hot in a kadai. take about 1/3 cup of the corn flakes in the sieve. immerse the fine sieve ladle in the hot oil. fry the cornflakes, stirring with a spoon, till they expand, become golden & crisp. don’t brown the corn flakes. shake the ladle to remove excell oil. drain the corn flakes on a plate lined with kitchen paper towel. 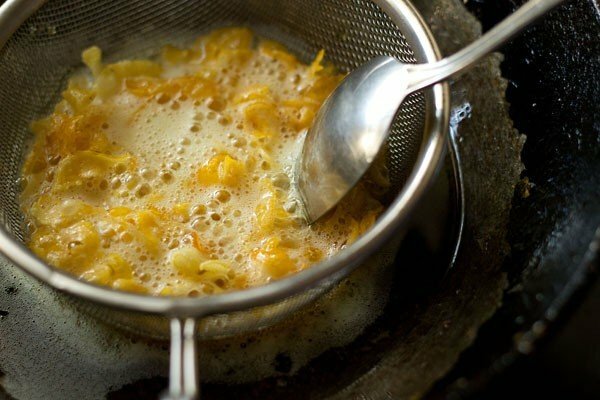 fry the rest of the corn flakes in the same way. fry them in the same way, stirring with a spoon, till they are crisp and crunchy. remove and place the peanuts on the kitchen paper towel. now add cashews to the to the sieve ladle. in a similar way, fry the cashews till golden. 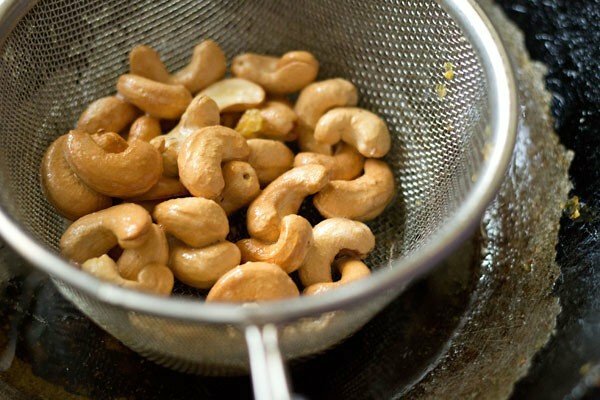 remove and drain the cashews on the kitchen paper towel. 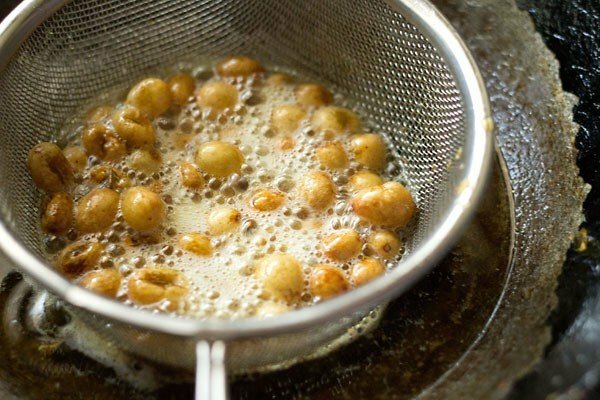 if using roasted chana dal, then fry too them this way. next add the raisins. fry them till they become plump & swell. don’t fry more as they become dense and chewy. drain the raisins too. fry the curry leaves for a few seconds. then place them too on the paper towel. when the mixture is still hot, add turmeric powder, red chili powder, powdered sugar and salt. stir well. 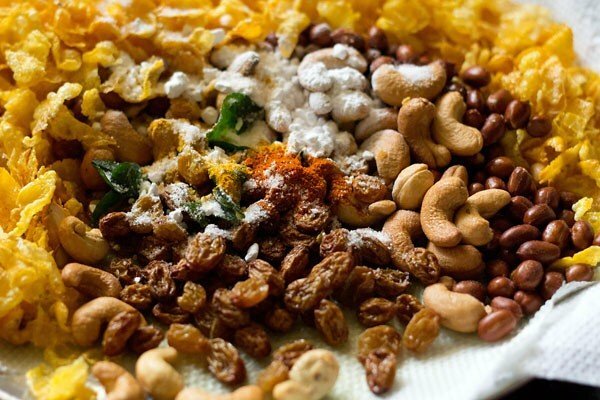 mix the powdered sugar, salt and spices very well with the rest of the ingredients with a spoon, taking care not to break the crisp corn flakes. check the taste and add more of the salt or powdered sugar if required. once the cornflakes chivda mixture is cooled, then store in an airtight container or jar. 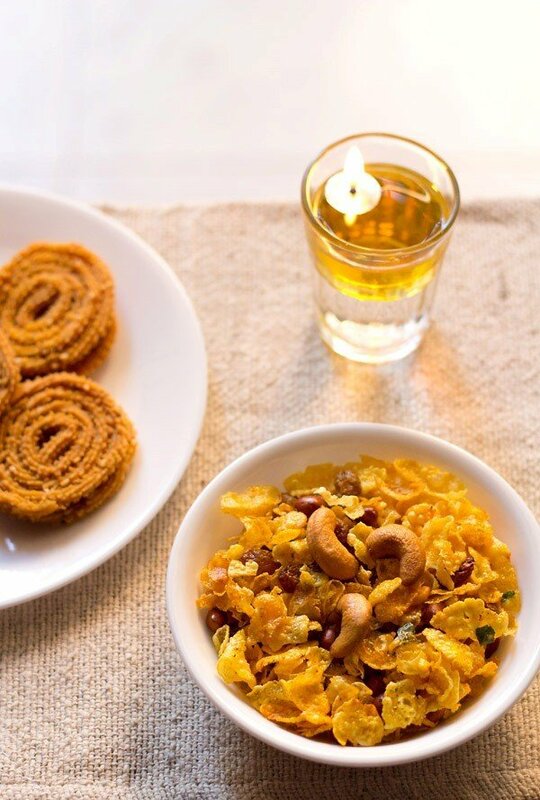 serve cornflakes chivda whenever required as a tea time snack. 1. first measure and take all the ingredients and keep them in individual bowls or plates. heat oil till its moderately hot in a kadai. take about 1/3 cup of the corn flakes in the sieve. immerse the fine sieve ladle in the hot oil. 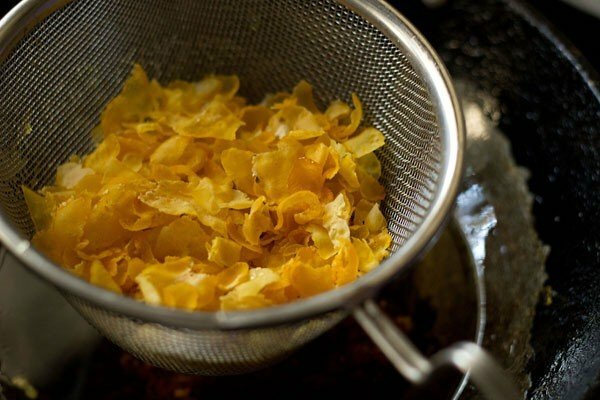 2. fry the corn flakes, stirring with a spoon, till they expand, become golden & crisp. don’t brown the corn flakes. 3. shake the ladle to remove excess oil. drain the corn flakes on a plate lined with kitchen paper towel. 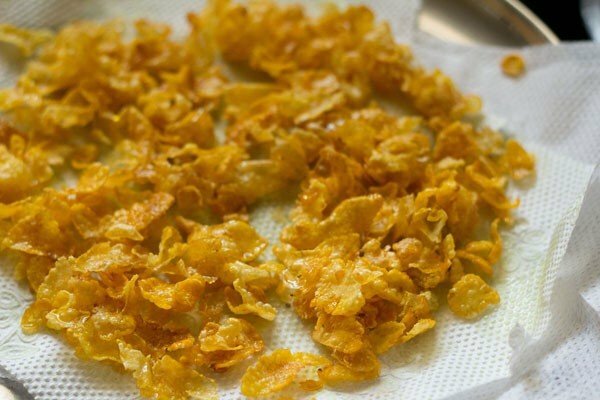 fry the rest of the corn flakes in the same way. 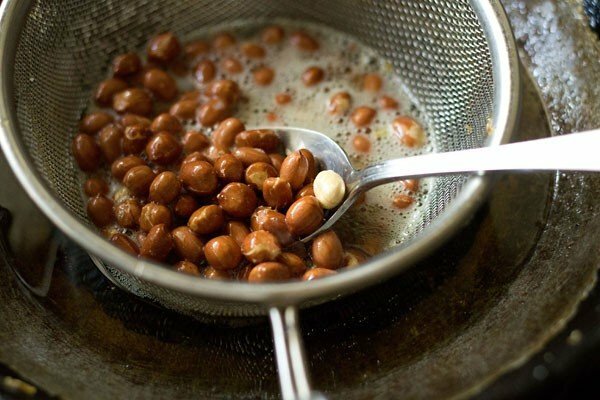 4. add the peanuts to the sieve ladle. 5. fry them in the same way, stirring with a spoon, till they are crisp and crunchy. 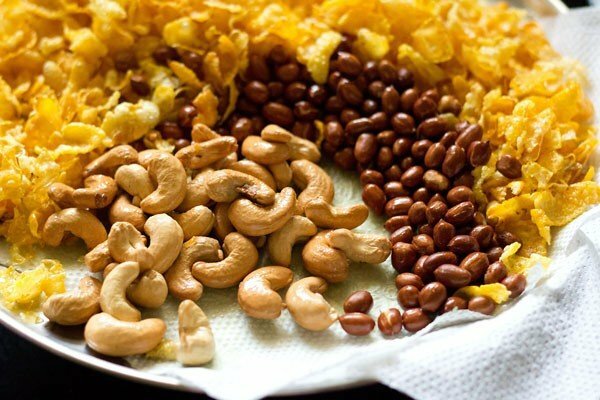 6. remove and place the peanuts on the kitchen paper towel. 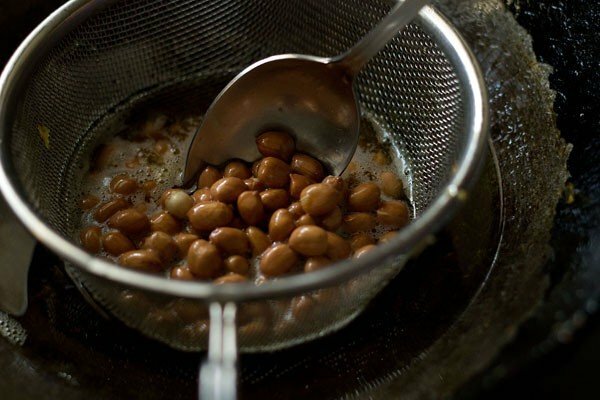 7. now add cashews to the to the sieve ladle. 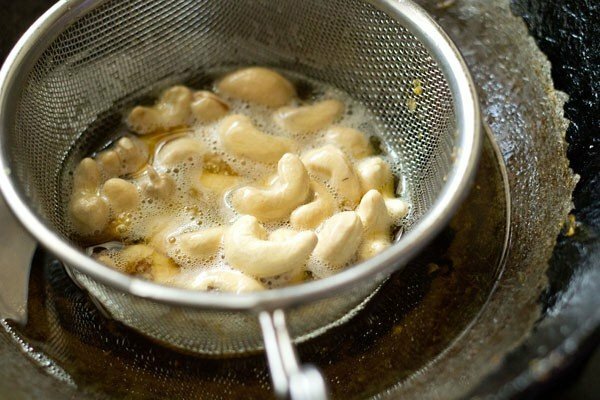 9. in a similar way, fry the cashews. 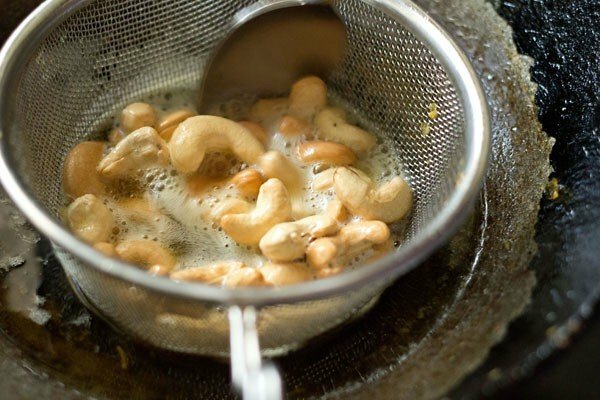 10. just fry the cashews till golden. avoid over browning. 11. remove and drain the cashews on the kitchen paper towel. 11. next add the raisins. 12. fry them till they become plump & swell. don’t fry more as they become dense and chewy. 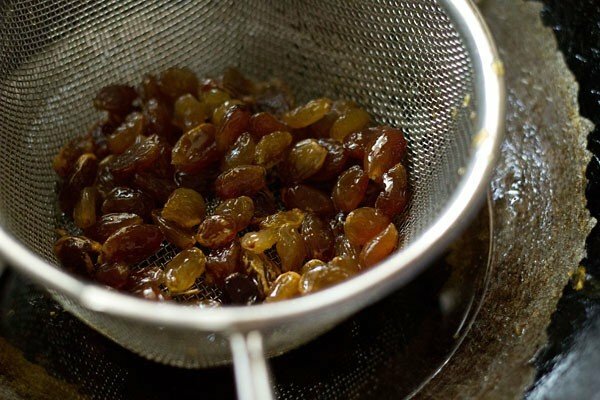 13. drain the raisins too. 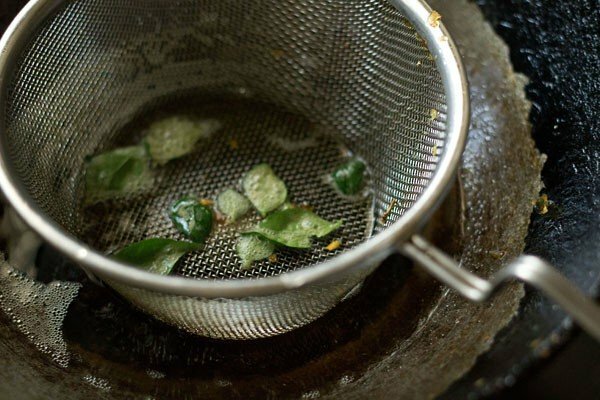 14. fry the curry leaves for a few seconds. then place them too on the paper towel. 15. when the mixture is still hot, add turmeric powder, red chili powder, powdered sugar and salt. stir well. 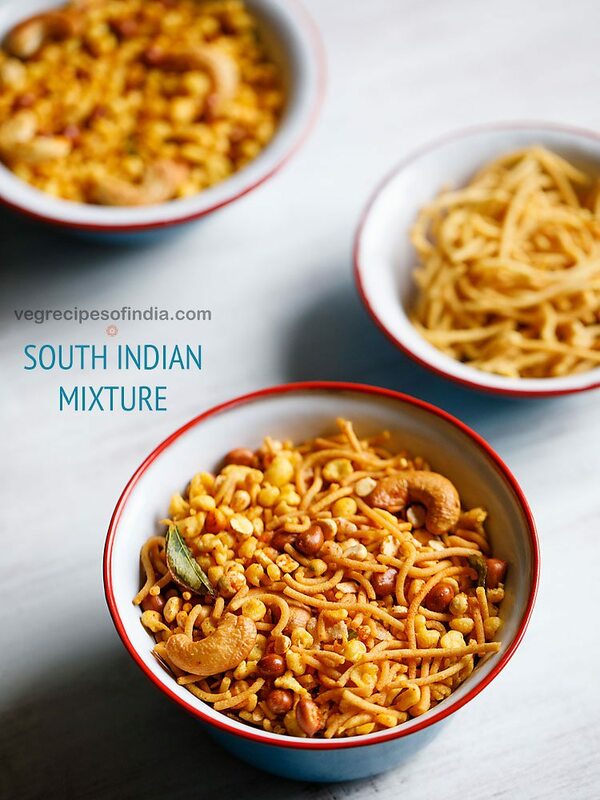 16. mix the sugar, salt and spices very well with the rest of the ingredients with a spoon, taking care not to break the crisp corn flakes. check the taste and add more of the salt or powdered sugar if required. 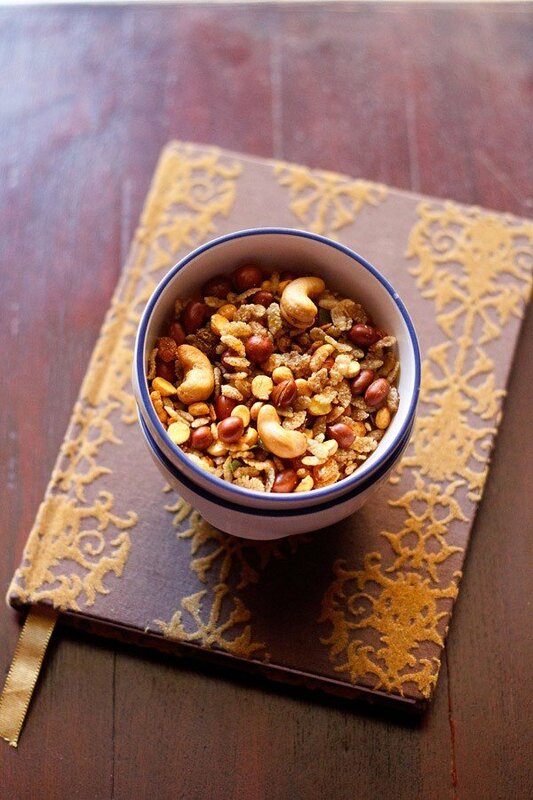 17. once the makai chivda mixture is cooled, then store in an airtight container or jar. 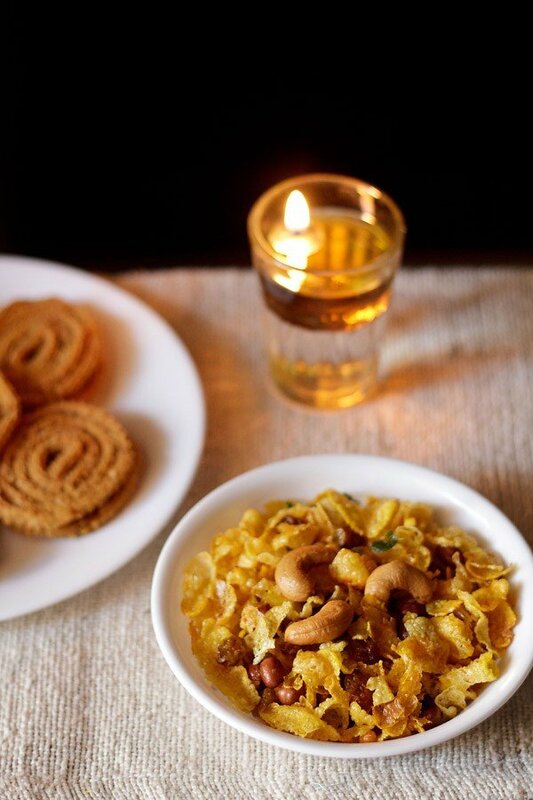 18. serve cornflakes chivda whenever required as a tea time snack. thanks shubha for sharing. when i try i will keep this in mind. sizzler recipe has been requested by some more readers. i will add it in some time. Another easy simple tasty recipe. Thank you. May I know which tawa do you use for making crispy dosas? If you can let me brand and any other specifications for the same. thanks sabina. for preparing dosas, i use two tawas – one is cast iron tawa, which i had purchased locally and the other one is a non stick ceramic finish tawa from wonderchef brand. Hi, A healthier way may be is to air-fry all with a quoting of oil instead of deep-frying. 1. since the dry masalas are sprinkled on top, the chilli powder etc had a very strong raw taste to it. So next time I will make a tempering with a little mustard seeds and saunf (fennel seeds), chopped green chilli and saute ingredients (except cornflakes) and spices in couple of tablespoons oil in a seperate pan and add to fried cornflakes, like a lot other chivda recipes are. 2. The slight tanginess is also missing in the recipe. Maybe citric acid (nimbu phool) or amchur etc could be added for taste. thanks neha. the raw taste goes well with some folks and not with some. we were fine with this. as you mention, next time you can saute the spices before and then add. there is no tanginess in the recipe as we do not prefer it. in most recipes, amchur or citric acid is added. so again it depends on a person’s taste and preferences. I have a confusion regarding the kind of flakes u have used. I can only think of kellogs corn flakes which are easily available in the market. Will they go well in this recipe? Also, they are kind of crispy already. The ones used by you look different and become crisp only after u fried them. Which ones have u used? these are dried corn flakes. known as corn poha or makai poha. they are not kellog’s corn flakes. you will get these at reliance mart or stores. you can make these with kellogs corn flakes too. just roast them with or without any oil for a few minutes. also roast the cashews etc with 1 or 2 tsp oil. then mix everything.